Two fire crew members have been killed in a major blaze at a fireworks depot. 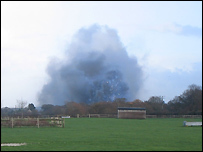 At least 12 others have been injured, some seriously, in the fire at the Festival fireworks UK Ltd factory near Halland, East Sussex. Emergency services rushed to the scene at The Broyle from 1350 GMT. A 200-metre exclusion zone is in place. 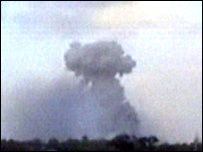 Eye-witnesses reported seeing a huge mushroom cloud of smoke from several miles away and explosions of fireworks which sent debris through the air. Sussex Police said a 49-year-old fire officer and a 63-year-old member of the fire support staff - a retired officer - had died. Nine fire service workers were injured along with two members of the public and a police officer. Twelve ambulances, 10 fire engines, and an air ambulance attended the premises. Lewes MP Norman Baker said: "It is a terrible event and I feel deeply sad for the families that have lost firefighters. "It is always sad when someone dies, but particularly when they are serving other people and part of the emergency services and essentially putting their lives on the line for other people." Seven casualties were taken to the Royal Sussex County Hospital, in Brighton, including five from the emergency services. Two of the seven are said to be in a serious but stable condition. The other patients are being treated for burns and what are described as "limb injuries". Jim Parrott, south-east region secretary for the Fire Brigades Union, said: "We are extremely sorry for the loss and feel for the families of the two firefighters. "We will take every step to co-operate with the East Sussex Fire and Rescue Service in their investigations." BBC reporter Rob Smith said the fire was still raging and fireworks were going off hours after the blaze started. John Winter, whose brother owns the depot at Marley Farm, in Shortgate, told BBC News 24 there had been "an almighty bang, and the place shook". He said his brother and family had managed to get out of the building safely, but their house had burnt down. Meanwhile, Jason Winter, nephew of the depot's owner, said the family's pets had died. "They have lost everything, even down to their dog, their dog's in the house, the dog has died," he said. "They have lost the house, they have lost garages, offices, all the buildings, they've lost their vehicles, their lorries, they have even lost their guinea pigs." Residents in the area have been evacuated to Ringmer Community College and a 200 metre exclusion zone put in place. It is understood the fireworks store is a concrete complex with steel doors. Gary Walsh from East Sussex Fire and Rescue Service said the blaze had been contained to one building. Sussex Police Assistant Chief Constable Jeremy Paine said the fire was likely to remain burning until Monday before it could be brought fully under control. "The advice from the Fire and Rescue Service is that the fire needs to be allowed to burn for a while because of health and safety concerns around acetylene tanks that may be present." Jo Hyne, who lives about 500m from the depot, said she heard a loud bang which she had thought at first was thunder. She said there was "a colossal amount of smoke, and rockets going off", before a much larger explosion that shook her house. Another eye-witness, Richard Mitchell, watched the drama unfold from outside a pub in Lewes Road, Ringmer. "It was like a fireworks display with a fire in the middle of it," he said. Claire Freeman, from Ringmer, had been eating in the Wok Inn next door to the depot when the fire broke out. She said diners were evacuated to the car park at the time of the largest explosion. She told the BBC news website: "Pieces of wood [were] falling, hissing into puddles around us, at which point we left pretty sharpish."